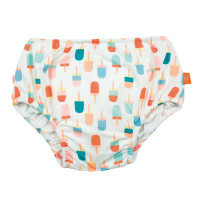 The Lassig swimming diaper ice cream ensures that baby's skin stays as dry as possible while high-quality materials provide a maximum wearing comfort. Product information "Swim Diaper Girls , Ice Cream"
description & equipment Swim with LASSIG. Our integrated swim diaper features an innovative moisture-absorbent lining and padding system which traps moisture in the inner lining and directly transports it outward over a large area so that baby’s skin stays as dry as possible. Maximum wearing comfort is ensured by high-quality materials, seamless fashioning in the seat area, and a perfect fit. This beach fashion also features UV protection of 50+ to help protect baby’s sensitive skin from the sun’s harmful rays. The cheerful designs and colors will capture every little bathing beauty's imagination. Lassig< /strong> develops innovative, cheerful, vibrant and captivating products for children and parents. Our award-winning products are designed with recycled materials, produced sustainable and are as colorful and diverse as life itself. We are inspired by streets and catwalks worldwide. Working as a team, we design bags, textiles and other beautiful and functional things for people who want to emphasize their zest for life and their individuality by choosing high-quality, casual products. Lassig supports the responsible task of parents with functional products that not only fulfill their specific needs in everyday life – but also those of a sustainable lifestyle. Therefore, Lassig only manufacture diaper bags and kids products from uncritical, tested for harmful substances (Out of question are: PVC, nickel, azo dyes, lead, phtalate). We only make way for the joy of living, activity and a conscious sustainable use of resources offered to us by nature.